This week I've been writing too much about stuff I bought. Time to write about something I found. Or rather my friend found. Actually, my friend's grandma found. 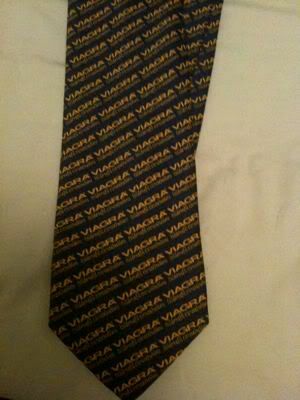 It's a Viagra logo tie, unearthed in a thrift store. Do you ever wonder why some products are ever made in the first place? As in, who would wear this tie and why did Pfizer think this was a good merch idea? Why do you exist, Viagra Tie?!?!??!! November 19, 2009 by Adele Chapin.